A variant of the robocar is the deliverbot. This is a robot vehicle meant to carry cargo, not people. DARPA's Grand Challenge is in large part an effort to develop deliverbots for the military. They want robots to deliver cargo in war zones, so soldiers' lives are not put at risk. Deliverbots could range from very small (and light) robots the size of a suitcase to full-sized trucks ready to haul heavy cargo. Folks needing to move cargo could summon up a deliverbot of the right size for their cargo. In many cases, people might have a car with very little cargo space, and have a deliverbot take their cargo for them while they ride in their car. This may seem inefficient, but it's more efficient than having a minivan with lots of unused cargo space most of the time in case you need it. In most cases, the deliverbot problem is easier to solve than the autonomous robocar. Deliverbots won't care a great deal about speed. They won't care about the comfort of the cargo, or even that much about its safety. They mostly will care that they don't hit people, or anything carrying people. They won't need windshields and will be wrapped in inflated, aerodynamic padding to limit damage if they should hit something. The small ones will be so lightweight that it will be almost impossible for them to seriously injure people at low speeds. Another interesting project is DustBot. This robot travels narrow pedestrian streets in old cities to get your trash and take it to the dump. It's an interesting early application since the cargo is neither fragile nor valuable nor in a hurry. Deliverbots have some interesting consequences beyond just being handy for delivery. It's worth exploring some of them. I believe small deliverbots will be very cheap. Their energy costs will be well under a penny per mile, and after the computer components fall in price thanks to Moore's law, the units themselves may cost no more than a few thousand dollars. With a life of 200,000 miles or more, that suggests a full cost of under 3 cents/mile. A deliverbot, other than the computer control system, is just some batteries, electric motors and a chassis and shell. Few safety systems are needed for the cargo. No climate control is needed except for special cargo. Profitable delivery anywhere in a city could then be sub-dollar in price. With deliverbots, you will be able to get absolutely anything for sale in a big city about as fast as you can get a pizza today, and it will be cheap. Certainly cheaper than going to a store yourself. This changes the very nature of stores, especially big-box warehouse stores. You'll go to stores for the service, and to personally see and try on products before you buy, but the best prices and speed will always come from warehouses scattered around town ready to send you a deliverbot. Serices could also be done by deliverbot. Send out your laundry to a wash and fold. Send out a broken item for repair. A deliverbot could be set up to deliver to you (ie. where your phone is) not to your address. It would never wish to come to your home when nobody is there to receive the package. Robots can do delivery on your schedule, not the schedule of their delivery trucks. Some deliverbots would be only for you. Others might have a series of compartments with doors, and the one with your shipment would be unlocked when it gets to you. Depending on the product being delivered, you might even ask to get delivery to where you are at the time -- an office, a friend's house, or the parking lot of a business you are visiting. Cheap deliverbots could mean that cargo space will not be a big consideration for many car purchases. If you want to keep things with you at all times -- like a toolbox -- you might get a car with room for that. But for your unusual hauling loads, you're much better renting a deliverbot with the capacity you need. Before a flight, it could be common to hand your checked luggage to a deliverbot some hours before your trip. That bot would take it to a larger cargo truck going to the airport, where they would have all the time they want to screen it for explosives. Chances are another deliverbot would take it to your destination hotel once you land -- no waiting for it, no hassles. Food delivery becomes easy and cheap with the deliverbot. One could see not just restaurants delivering, but families getting together in co-ops so that each day, one or two families prepare a giant meal and rush it out to all the others by deliverbot. Really quick on-demand rental may change how we own things we don't use every day. There are a wide variety of items that might make a lot of sense to rent rather than buy, if you can get one delivered right inside your house on 10 minutes notice, or exactly on time with an appointment. Power tools, especially big machine tools. Cleaning equipment, and things like pressure washers and even fancy vacuums. Office equipment -- scanners, projectors, superfast computers. Party supplies and specialty kitchen appliances. Everyday items when away from home. This list goes on and on. Many of us buy these items and store them 99% of the time. A deliverbot could be given the access code to your garage door, and thus bring items right inside your home or workshop. Instead of buying a cheap unit, one could rent, for far less money, a top quality unit. Of course there would need to be some cleaning and prep between rentals on some units, but even if not, anybody who got a bad, dirty or damaged unit could quickly get a replacement. You might think all this delivery (and empty return trips) would be wasteful, but for many items, it's a lot more wasteful for everybody to have and store something they use only a small fraction of the time. Especially if the item requires a lot of energy to manufacture. It might even make sense for a house to have a room, with a garage-door to the outside, which is the "rental room." This in fact might well be the former garage of the home. The rental room, with a remotely openable door for deliverbots, would perform different functions based on delivery. For example, a deliverbot might bring exercise equipment into the room, and it would be a home gym for an hour. In the evening, it might bring in a guest bed and be a guest room for the night. Another day it might bring in big tools to be the machine shop. A "room of requirement" for the modern age. The Japanese, short on space, live like this a bit. If you get a room in a typical small Ryokan in Japan, you will find that during the day there is no bed, just a sittle table. At dinner, a dining set up is brought in. In the evening, they move all that away and pull out the futon. It works. One thing deliverbots could deliver is other robots. Specialized robots for specialized tasks. As you know, you can already buy robots that vacuum the floor or clean your gutters. The future will bring fancy, highly specialized, possibly highly expensive robots for other household and garden tasks like cleaning, weeding, painting, laundry folding, window washing and more. And in even more advanced cases, construction and assembly of prefab and flatpack items. 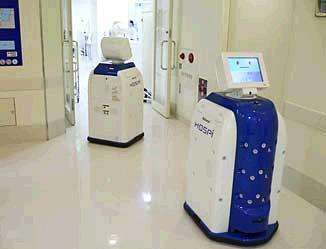 You might not afford such a specialized robot but you can rent one for an hour. One could even imagine a variety of larger goods which are shipped unassembled, but come with a robot that assembles them, and moves on to the next customer. See my notes on the bikebot which delivers a bicycle to you, where you need it for a healthy ride. Now consider how robocars spell the end for urban mass transit.